A couple of years ago, I wrote a post titled, "The Very Ugly Can." Once you put money in, you can't take it back out. 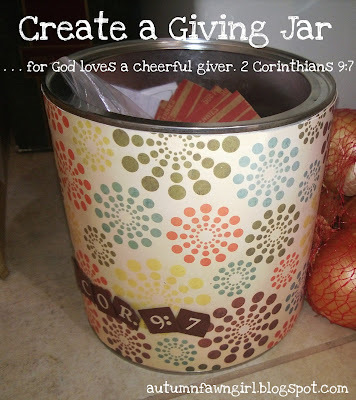 The money in the jar can only be used for charity and the like. We started this whole thing when finances were extremely tight. I didn't think I'd have anything much to give, but I felt led by God to do it. By faith and obedience, what started out as ugly on the outside (just a big, silver coffee can) quickly became beautiful on the inside. To read the back story, click the above link. Fast forward to the present - April 2013. Our giving jar, what we affectionately call the Money Bucket, is still going strong. Honestly, I wondered if the whole idea would sort of fizzle out over time, but I stand in awe of how God continues to use this small thing. I am amazed at how spare change and dollar bills add up over time. Since starting the Money Bucket, It's been especially rewarding to see how God leads my kids to cheerfully participate in giving. Just by observing my kids in the midst of this experience, I've come up with a few reasons why I think they are able to give cheerfully. 1. They are not forced to give. We let our children choose whether or not they put money in the bucket. We want their actions to be Holy Spirit led in this area, not parent led. It's not that we don't ever encourage or talk about giving. We do. We teach what the Bible has to say about giving, and that all Christians are called to give in some way. 2. They are not required to give a certain amount. This is kind of an extension of the first point - obviously if we don't force our children to give, then we don't require a certain amount either. Here's why: My husband and I believe that according to the New Testament, believers are not required to give a certain percentage of their income. We believe this falls under the requirements of the Old Testament Law. I am certainly not trying to stir up a debate or anything, I am simply giving insight as to why we personally don't require a certain amount from our kids. Our belief is not an excuse to get out of giving. To the contrary, we believe Christians are free to give more. The more money you've been blessed with, the more money you are free to give away. It's not about stopping at a certain amount or percentage, it's about giving when God leads. And sometimes it's about obeying even when we think it's going to hurt a little. (Like when I felt led to start the giving jar!) We truly want to impart a spirit of giving to our children by teaching them to listen to the Holy Spirit. 3. They are included in giving decisions. For the most part a lot of the ways in which we give our "Bucket Money" is the same, and our kids know how the $ will be spent. They know we use it to buy our Compassion child birthday and Christmas presents, they know I like to give to Mercy House every month, they know we use it to be able to prepare meals for people from church, and they know we try and donate items to an orphanage that our church supports. This past Christmas, we still had some $ left in our bucket, so for the first time the kids and I decided to pick out items from the Gospel for Asia gift catalogue to donate to needy families. I let the kids choose what items they wanted to give. I could tell that it was real blessing for them to be involved in that. Other opportunities to give come up throughout the year as well. We can't do everything, but it's truly been wonderful watching God work with what we have. 4. They are kept up-to-date on how our family's willingness to give is blessing others. I always read aloud or have my kids read the letters from our Compassion child. He always sounds so incredibly grateful. I try to keep them up-to-date with what is going on at the Mercy House. I keep a list in the bucket of all of our donations, not so we can boast and brag, but so that we (my kids especially) know exactly how the $ is being used. 5. They are encouraged to keep what they give between God and themselves. I am so thankful God put it on my heart to start this. I think it's great that my kids get to really experience the joy of giving. Hopefully starting the habit now will make it easier for them to keep the habit throughout their lives! How do you teach your children to give generously? Love this idea! I am always looking for new ways for my children to give.